Ground pork is stir-fried with Thai flavours in this quick and easy recipe for two. 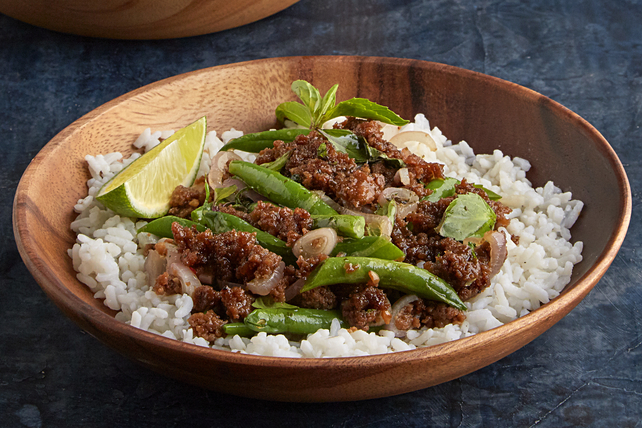 Ready in less than half an hour, our Spicy Thai Basil-Pork & Green Beans is served with a side of hot cooked rice. Heat Italian dressing in large nonstick skillet on medium heat. Add shallots and garlic; stir-fry 2 min. Add beans; stir-fry 3 to 4 min. or until crisp-tender. Add meat mixture; stir-fry 5 to 7 min. or until meat is done. Stir in basil; stir-fry on medium-low heat 1 min. or just until wilted. Prepare using Italian or regular fresh basil.